The three most common dangerous currents in the Great Lakes include rip, structural and longshore currents. 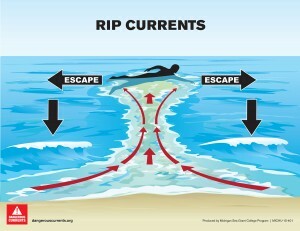 Several other dangerous currents, as well as wave height and period (time between waves) are also factors for swimmers. This webpage provides diagrams and information about dangerous currents and breaking waves, developed by Michigan Sea Grant in collaboration with the National Weather Service. Rip currents form when waves break over a sandbar near the shoreline and the water and its momentum get trapped between sandbar and shore. When the water and the momentum build up, the water has to go somewhere. One of the ways the pressure is relieved is when water returns to the lake in the form of a rip current, a narrow but powerful stream of water and sand moving (ripping) swiftly away from shore. Rip currents that vary in size and speed can be found on many beaches every day. Rip currents will not pull a swimmer under the water, but will carry them out to the open water, away from shore. While it can be difficult to predict when and where most currents will occur, the opposite is true for structural currents. The currents found alongside or as a result of structures like piers and breakwalls — called structural currents — are usually always present. Structural currents are dangerous on their own, but when paired with others like longshore or rip currents, the combination can create a washing machine effect, moving the swimmer from one dangerous current area to another with no clear path to safety. Avoid jumping off or swimming near piers. 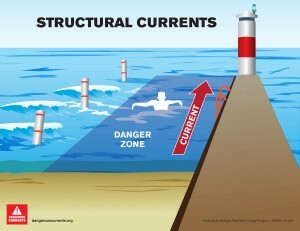 The currents found along these structures are often dangerously strong. As the name suggestions, longshore currents move parallel to or the ‘long’ way along the shoreline. These currents will exert a force to move along shore, making it difficult to remain in front of a spot on the beach. They often happen between the first and second sandbars near the shore. 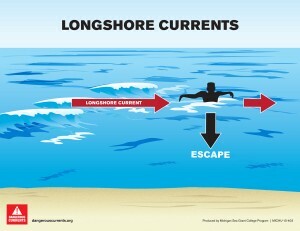 Longshore currents become more dangerous when they combine with rip currents or structural currents since they can move a swimmer swiftly down a beach and into the path of another current or into a structure (pier or breakwall), making it more difficult to swim to shore. Be aware of longshore currents that may carry you toward structures. Stay at least 100 feet away from any structure. 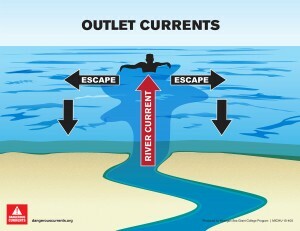 Outlet currents can be found where rivers and streams empty into the Great Lakes. The flow of water from the river or stream can move quickly. As it enters the open water of a lake, it may take awhile for that current to dissipate. Pair that with currents that are present in the lake and the situation can become dangerous. While they are tempting to swim in because they are often warmer than the lake water, avoid swimming in or near outlets. A channel current is like a river running parallel to shore. 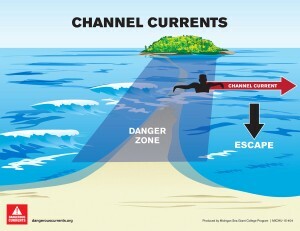 With a channel current, typically there is an island or structure such as a large group of rocks not far from shore. A channel current forms when the flow of water speeds up as it goes between the island and shore, like a bottleneck. This is made worse by the presence of a submerged or partially submerged sandbar connecting the beach to the island, which allows pressure to build behind the water and waves until it breaks through. When the wind speed increases, the waves also increase in intensity, and this causes the current to become stronger and faster. The best escape route is to swim to the shore, not the sandbar. 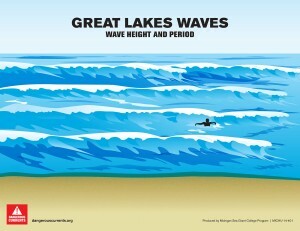 Great Lakes waves are different than ocean waves. For example, they have a shorter wave period, which means they travel toward shore faster. On the Great Lakes, wave periods can be as short as 3 to 5 seconds. This means waves will repeatedly hit a swimmer every 3 to 5 seconds, which leaves little time to recover or catch a breath and can quickly lead to exhaustion. The combination of a short wave period with strong currents can quickly turn dangerous for even strong swimmers. Wave height can also be a factor alone or when combined with currents and short wave period. Most fatalities and rescues on the Great Lakes have occurred when waves ranged from 3 to 5 feet, however, a number have also occurred when waves were only 2 to 3 feet. Use caution on days when a yellow warning flag is posted. Stay on the beach when a red warning flag is posted. Dangerous Current awareness is part of a state and regional effort led by Michigan Sea Grant in collaboration with the NOAA-National Weather Service, the Michigan Department of Environmental Quality (MDEQ), the Michigan Department of Natural Resources, Michigan Technological University and others. The MDEQ Coastal Management Program supported the development of many educational programs and public outreach products.